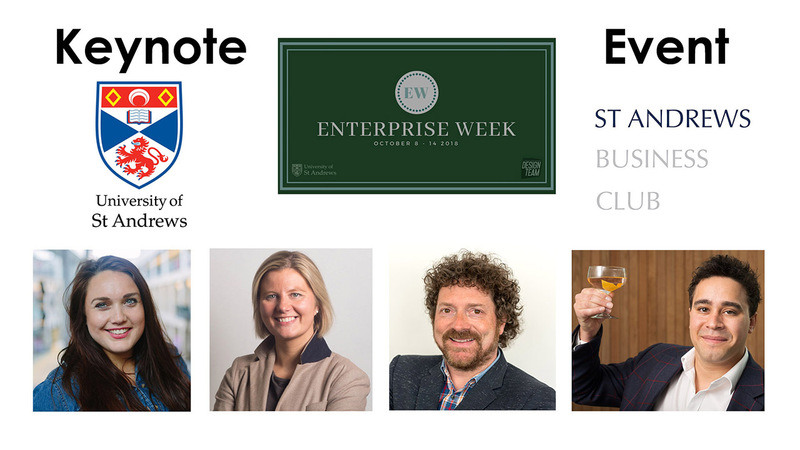 In the 2018 University of St Andrews Enterprise Week Keynote Event, Chris van der Kuyl, Chairman & Co-Founder of 4JStudios and digital entrepreneur, Lizzie Brough, Co-Founder & CXO, Kindaba, Jen Munro, Founder & Managing Director, ISSOS International, and Sam Trett, Founder & Owner, LoCa Bev – Minus 33 shared their entrepreneurial journeys, lessons learned and advice for anyone considering their own venture. Thanks to them, the Enterprise Week Committee and everyone who attended for making this such a great event. For photos of the night, go to the Album on our Facebook page. NEXT EVENT: The Club’s next event is October 25 – ‘Ask the Minister’, when Lord Ian Duncan will talk about and answer questions on policies affecting business.